Yeah, I bought a towel. But look at that face! 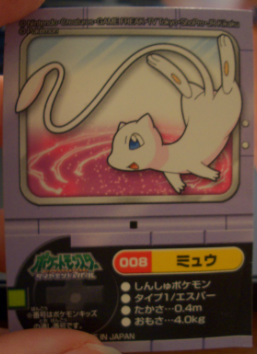 I really loved everything for the Walky promotion, but budget and restraint call for limitations. 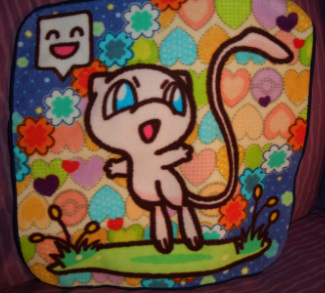 This towel was so colorful, and it's a unique piece of merchandise instead of a plush or figure mountain. Makes for a nice display too! This is it. The most expensive item in my collection. (In the sense that it's the item I spent the most on). Yup, a $25 glasses case. I got this so I could actually use it! 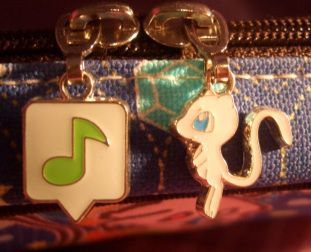 My current case is a beat up piece of crap, and what better way to replace it than an adorable Mew case with snazzy little charms? 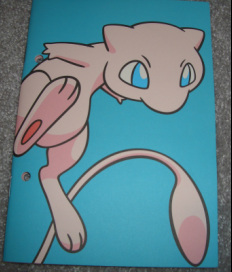 The case also came with a cleaning cloth that has a Eevee, Pikachu and Mew Walky pattern on it, but seems like they hate Mew because theres not one full picture of a Mew on it. 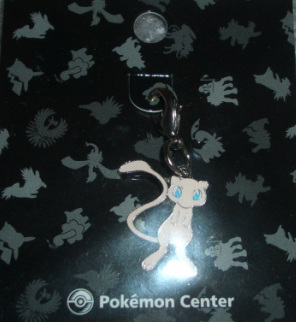 Of course :P Below is a picture of the bottom of the case, as well as a close up of the little zipper charms. 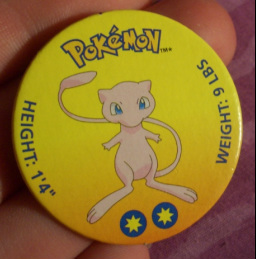 I was so lucky to find a lot of three rings with Mew, Pikachu, Meowth, and a Pokeball on each on eBay. I hosted my first solo Group Auction with these suckers, and I was really excited to be able to own this. 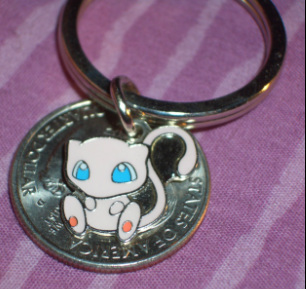 Yeah, its a super tiny little metal keychain, but thats what makes it so cute! I also really like the Pokedoll merchandise better than the actual plush line XD You can see just how small these charms really are thanks to a stray quarter. I missed out on this guy so may times! Slept through an auction, slow to reply on LJ, crazy sellers, you name it. Finally got this one on Y!J, and somehow won it for a very cheap price. And its minty fresh too! 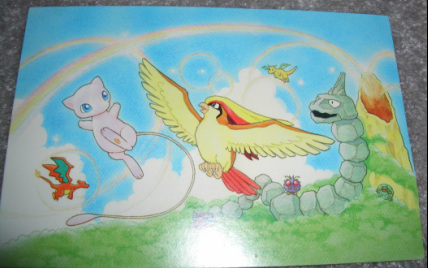 I love the Tropical Island TCG set artwork! 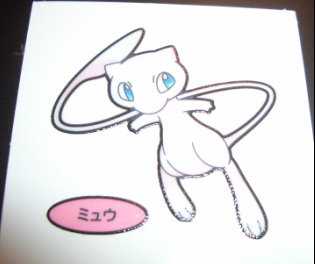 All the Pokemon are so cute and I really like the bright, soft colors. I kept waiting to get this postcard for cheap, and a few months later I was successful! Love it. 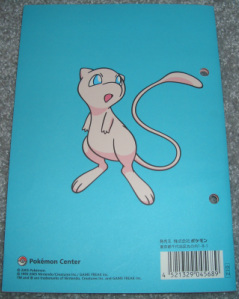 Funny how over a year later Walky Mew stuff is still creeping into my collection. Can't resist it. 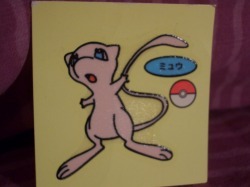 Its a stamp. 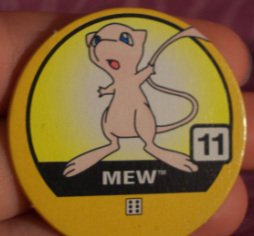 With a Mew. 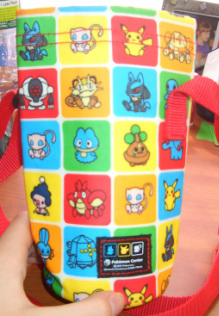 Yes, that is a Pokedoll waterbottle holder. LOL. I found it on eBay, and ended up buying it. 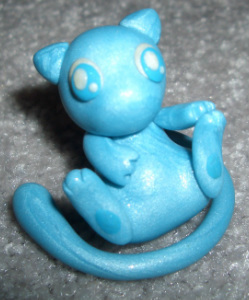 I really love Pokedoll art, but everything is just rare, and more likely than not, out of my price range. So I get a $10 water bottle holder 8D I should probably wear it around, right? Right. So badass. Pan stickers are awesome. 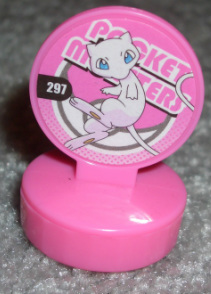 When I first browed pkmncollectors I thought "Pfft, I'll never buy some silly stickers" .. which is a shame because I probably missed out on a ton of different ones before I realized how cool pan stickers are! 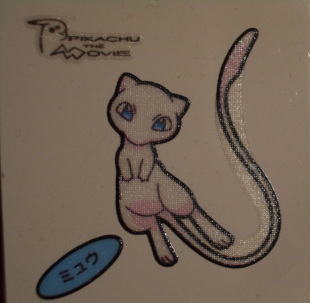 They aren't like normal stickers, but can easily peel off a surface, leaving no residue, and be reapplied somewhere else. They remind me strongly of window clings :P My DS never looked so pretty. Even cuter than my first one. I couldn't resist. Given to me as a freebie from one awesome pkmncollectors member! Was an extra in a TOMY GA I ran. Of course I had to keep it! 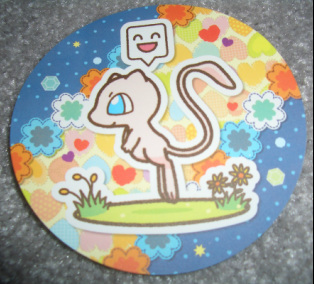 Got this as a surprise freebie in a package for a super nice seller from pkmncollectors! Here's some little drawings/sketches members have done for me <3 The two beautifulllllllll colored ones were done by pogaf! 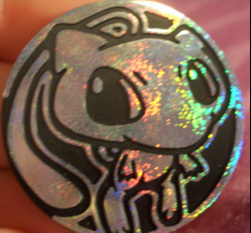 I am in love with the shiny Mew XD The really cute sticker was made by sapphire_kun, as well as the left most bubble mailer sketch. The one on the index card was my first, and is from volmise. 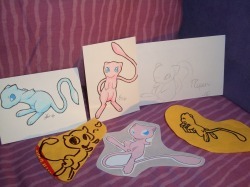 The bubble mailer sketch on the right is from azureyoshi! And the best for last! 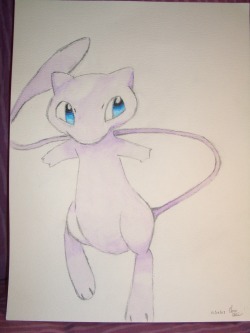 In December 2007 my lovely and extremely talented boyfriend drew this picture of Mew for me! I really love the way he did the eyes... I should have taken some more pictures of this. This was done with pencil and watercolor pencils I believe. Below you can see how big it is compared to my Pokedoll and Pokemon Center plush!